Develop your acoustical plan now, before the sources of noise enter the building. Whether you are breaking ground on a new open-concept office complex, designing a manufacturing plant or retrofitting a space to accommodate a trendy new restaurant, the acoustical experience for the end user can make or break your building. Take the time now to develop a sound strategy by bypassing these common mistakes. In a factory you have a noise problem if a person is exposed to a noise level greater than an A-weighted level of 85 dB. 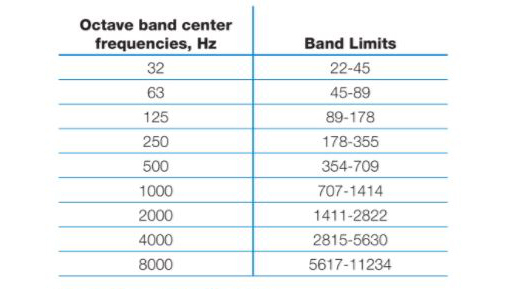 Even lower levels can be a problem, such as a 55 dB level in a classroom. Occupants should not have to rely on noise cancelling headphones or earplugs to function effectively. Even in a factory, ear protectors should only be considered a temporary solution. In general, if normal communication is difﬁcult, you have a noise problem. Want to get a better idea of what noise level you are dealing with? Download a free sound level app for your phone. Although you can treat a source of noise after installation, it’s generally twice as expensive and half as effective compared with designing proper sound control into the system from the beginning. Take time to understand your acoustical expectations before the source of the noise is installed or in the case of a restaurant, office or school – enters the building. Most equipment has several noise sources, all of which must be considered. When analyzing sources, be sure to study the spectrum of sound coming from the equipment. At minimum, obtain an octave band analysis of the noise being emitted. Understanding the frequency of noise you are working with will help you better plan your acoustical strategy. Back when our sole purpose on earth was survival we learned pretty quickly which sounds needed our immediate attention. As a result, our hearing has honed over the years to recognize certain octaves. To this day we find noises in these spectrums more disruptive. Knowing the octave band you are dealing with will also help you determine your solution. Different materials dampen sounds at different octave levels. For example, gypsum boards better address noise in low octave bands while, insulation helps block noise in high octave bands. A common waste of noise control dollars is the failure to consider all possible solutions and paths. To treat one sound source but not the others could leave unacceptable noise levels when the project is completed. To get a proper understanding of the acoustical situation you must study both structure-borne and airborne paths. While airborne noise is often contained to the area immediately surrounding the source, structure borne sound can resonate to other parts of the building. You cannot chase this noise throughout the structure. You have to stop it at the source by addressing all possible pathways for escape. Sound always takes the easiest path around or through a barrier. Construction gaps or air leaks are by far the easiest way for sound to pass from one space to another. Sealing these gaps where possible will not only lead to an improved acoustical experience but greater efficiency as well. With building envelopes getting tighter, offices moving to open-concept designs and mounting research on the effects of noise on healing, learning and productivity, there is increasing pressure on builders and building managers to deliver a good acoustical experience. Have questions about your acoustical design? We can help. Plus, a room designed to test acoustical modifications in real life situations and designing classrooms for optimal learning. Great post I would like to thank you for the efforts you have made in writing this knowledgeable article.